Knowing how to activate and then engaging your horse's hind quarters is vital to his long-term training and development. However for many riders, it can be a little daunting trying to figure out if he is truly in 'rear wheel drive' rather than 'front wheel drive' while they are working or schoolingtheir horse. However taking the time to begin asking your horse to work correctly from back to front will be a key factor in his overall development and training and also, the deciding factor between him becoming stronger when being ridden, or just remaining where he is, effectively capping his progress. 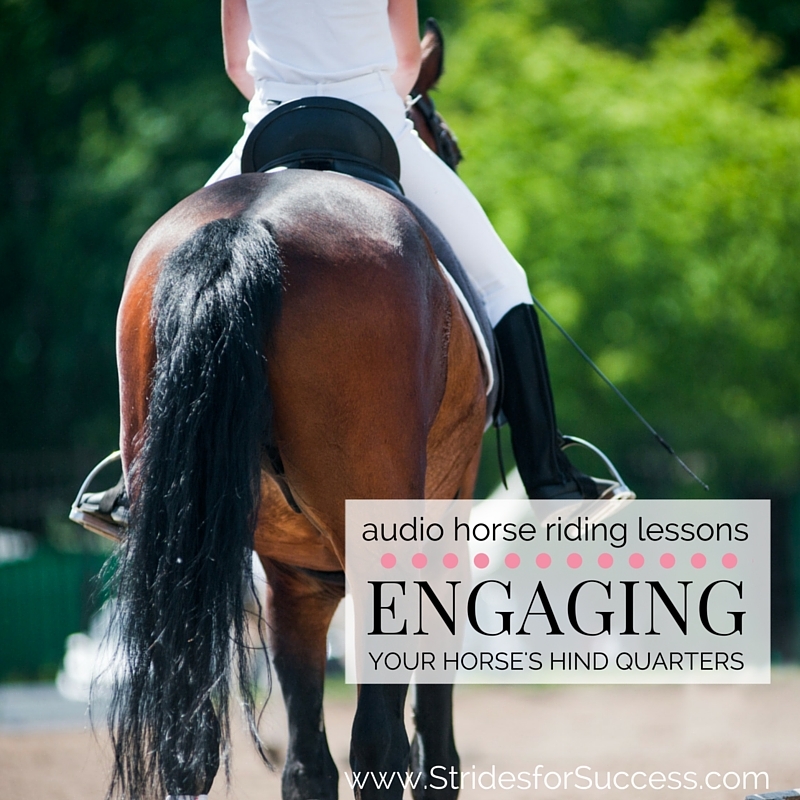 So, first and foremost when we talk about engaging the hind quarters, we are speaking about activating them or getting them to work while we are riding our horse and then connecting the energy produced to the front of his body. Engaged in this sense means to bind or interlock, so engaging the hind quarters is literally interlocking it with the rest of his body. Like I mentioned earlier, your horse being in rear wheel drive, means that his all the time pushing from behind, using his hind quarters. This is far more favourable when being ridden than pulling from the front with his front legs and shoulders. Responsiveness is part of the key to having your horse moving forward. A simple 'You ask; he responds' system in place which both you and your horse understand that there is a mutual responsibility from all parties if it is to work effectively. You are responsible for making sure that you are clear in what you ask. Your aids and also where you plan on going from that point are well thought out and executed. Your horse must then become responsible for adhering to your aids and directions in a willing and cooperative way. Once your horse is moving forward, it is then up to you to allow that energy being created from behind to connect with the front of the horse, thus actually 'engaging' the hind quarters. There are a few different aspects to allowing this to happen, but again, if any are missing it will result in the hind quarters being 'disengaged' and left to their own devices, separate to the rest of the horse's body working with the forward movement. Think of energy as being a little like water or electricity. It will generally always try to find the shortest and easiest route. If you allow your horse to become crooked through his body, the energy will not flow where you want it and rather 'shoot out the side door'. An example of this is on a circle, the hind quarters being allowed to swing out wide of the tracks the front feet have created. When this happens the energy, rather than pushing forward from behind and connecting to the front of the horse, will be lost out the side door of the horse, resulting in the horse going into 'front wheel drive' again. This is why straightness is so important when training a horse and rider. Many times we focus on how straight the horse is, but ignore the obvious twisting or tilting of the rider's body. Any crookedness in either horse or rider will again result in a disengagement of the hind quarters, which will see the energy dissipate and eventually be lost. When we learn to ride initially, we are often told to 'sit up', however we are rarely told why; other than the whole falling off aspect of collapsing through your body. But let's assume you have indeed mastered staying on, however you are still finding it difficult to truly connect the hind quarters to the front end of the horse (through your contact), it may just be because you are blocking this. Just as water can be dammed up, blocked or diverted, so too can energy. Sitting heavy in the saddle is the most common culprit here, but so too are shutting things down with your thighs. They can have a vice like effect on your horse if there is excess tension in your body. Also, leaning forward over your horse's shoulders or withers will be highly effective in shutting down any engagement of the hind quarters. Make sure that when you are riding, you are all the time encouraging your horse to use his back by being 'light' in the saddle. This is often as simple as sitting up through your rib cage, carrying your upper torso. This simple change is often enough to allow your pelvis to begin moving with the horse, which will in turn allow your horse to use his back. The unfortunate part of this is that most people look at the contact part as Step 1, rather than the final piece of the puzzle, or in this case for simplicity sake, Step 3. Contact is just like the responsiveness, there is a responsibility on both horse and rider to fulfil their end of the contract in order for it to work correctly and be effective. If either horse or rider try to force it, it will be lost. Similarly, if either side try to evade it, it will be lost. Many times we blame the horse for evading the contact, but I see many riders who also 'evade' through reins that are too loose, or fingers that are wide open and look better suited to playing a piano rather than holding their reins. Only when all three steps are in place can your horse truly engage his hind quarters and can you then begin to feel the difference between rear wheel drive and front wheel drive. The difference? Night and day! It feels like there is always energy there to perform what is asked. It feels like your horse moving forward with purpose. It looks so much more pleasing to the eye, as both horse and rider are in true agreement with each other, both maintaining responsibility for their individual part in keeping things together. There are many exercises you can do to begin asking your horse to use his hind quarters but none will really be successful until you truly understand what it means to engage and connect the back to the front.